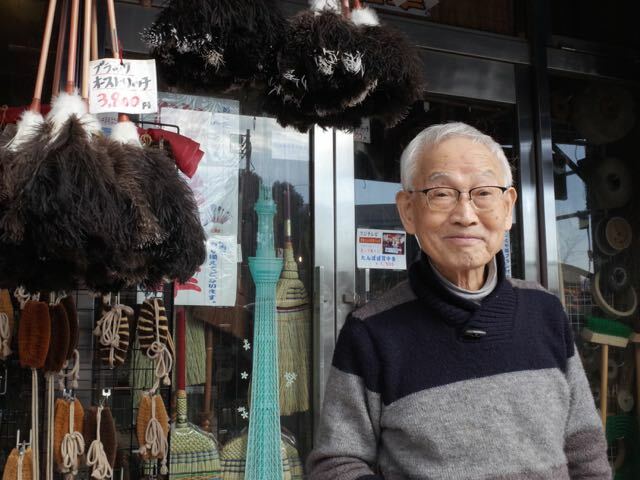 On the approach to the Kototoi Bridge, surrounded by bristles, Seitaro Ouchi and his son Kiyotake take it in turns to staff the tiny Marble brush shop (they have another, even smaller, store close to Sensoji). Have a look at this, says Seitaro, who is 86. I call this the Dustrich! 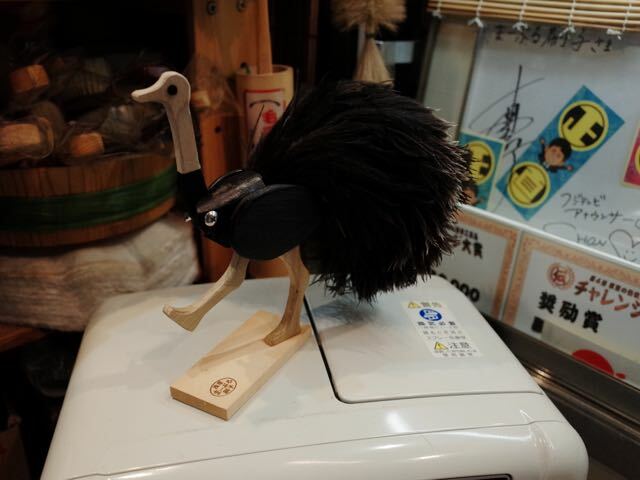 It’s a feather duster that rests on a wooden base shaped like an ostrich. Other items include a large cleaning brush with bristles in the pattern of a seahorse. I designed that too, he says. He isn’t shy. Ask if you can take his photo, he feigns bashfulness – then grins, straightens up and poses. He likes to speak English. His family is international, with a daughter who studied journalism at Columbia in New York. Framed awards are on one wall, including one from the Tokyo governor. What’s the best-seller? This one, he says, picking up a cashmere de-piling brush. This is what won the award. It has very short, wild-boar bristles in a semi-circle. 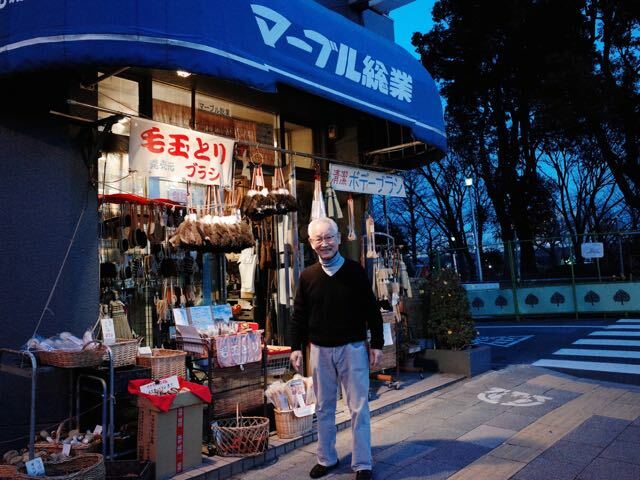 These brushes used only to be available to dry cleaners, says Kiyotake. But ordinary people started wanting them. They’re not so cheap. But you buy one and try it. It works really well. Like the horsehair toothbrushes. 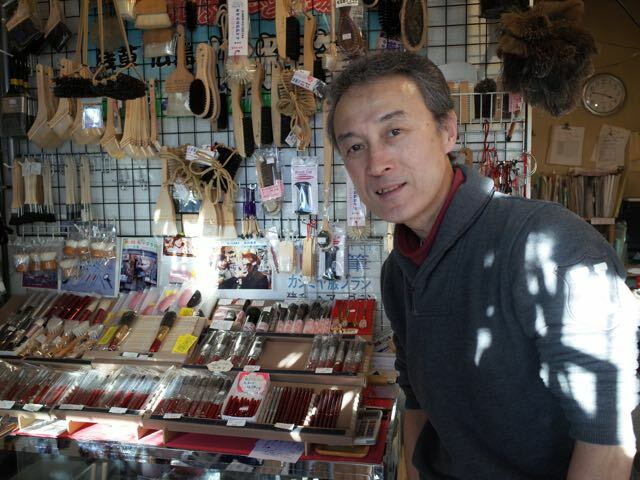 Marble’s are more compact than those of the other Asakusa brush store, Kanaya. But they feel good too. The Kanaya one impressed your dentist. You never told him you gave up on your electric toothbrush – then one day he said, It’s interesting your teeth on this visit have no tartar buildup. So you figure it’s the natural bristles. They come in three stiffnesses, including an especially hard pig’s-hair one. The metallic embossed logos are in different colours, to avoid family confusion. Seitaro makes his brushes at his factory nearby. It’s lucky the business has survived. Amid the Tokyo firebombing, Seitaro saw people who had melted. On the night of the heaviest attack, his mother took the children to an evacuation site north up the river. She put us into a manhole, he says. She survived too. After the war they all kept working. There is always need for a brush.